A consent form is a mandatory document that the participants in any project or program have to sign to begin their actions. Consent forms are also applicable for children when they travel with someone else other than their parents or when their parents are going away. Their parents can give emergency consent form to let the guide or the guardian to take the immediate medical decisions. 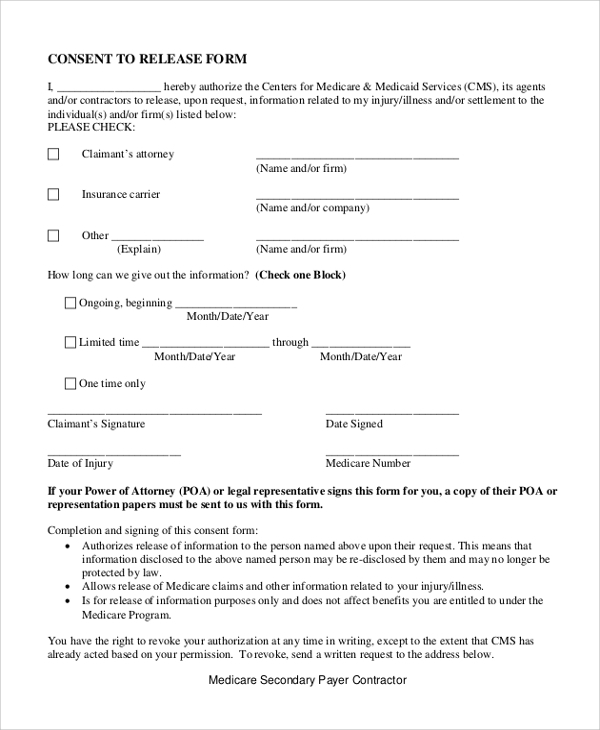 The following consent forms have the perfect format and sample to understand what exactly to be filled in such forms. You may also see the Survey Consent Forms. 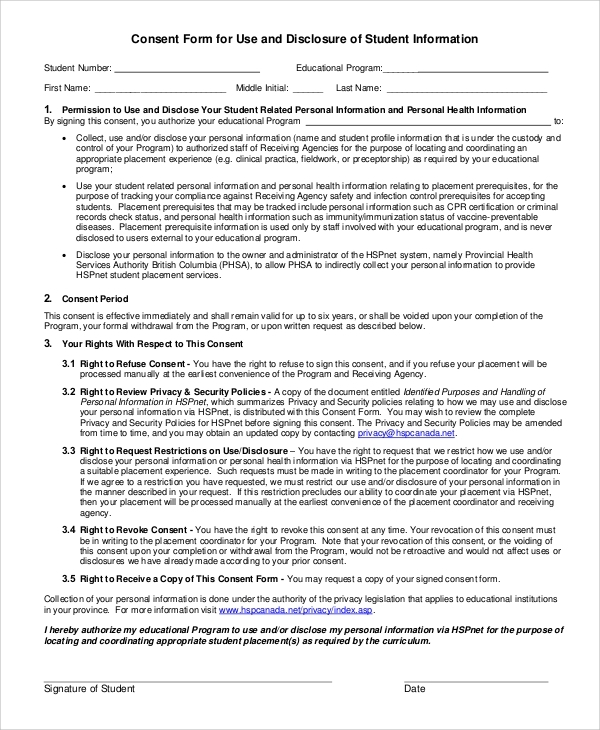 This is a general informed consent form for any project where the participants have to give their consent for participation after understanding the risks involved, the responsibility of confidentiality, agreement to follow the procedure and the condition for termination. This is a perfect format for an emergency medical consent form that parents furnishes to the guardian or the guide when their children go out on a vacation. It contains the medical conditions and insurance details which will come handy in such emergency situations. 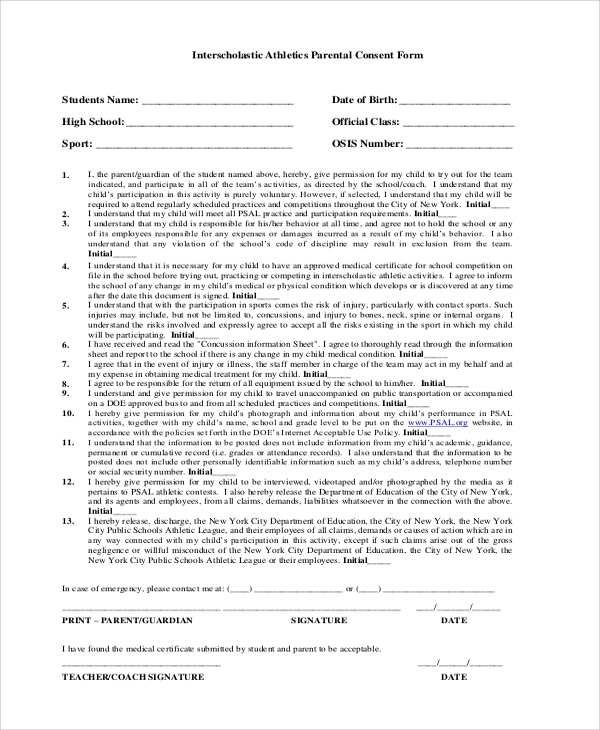 This is parental consent form for children who are going to participate in interschool sports events. Such forms contain all the details of the events and the risks involved and the declaration from the event organization of no liability in case of accidents. This is a letter of parental consent especially for a minor child who are supposed to stay away from their parent due to some reason such as travel. It contains a consent declaration, travel details, medical condition details and other necessary information. 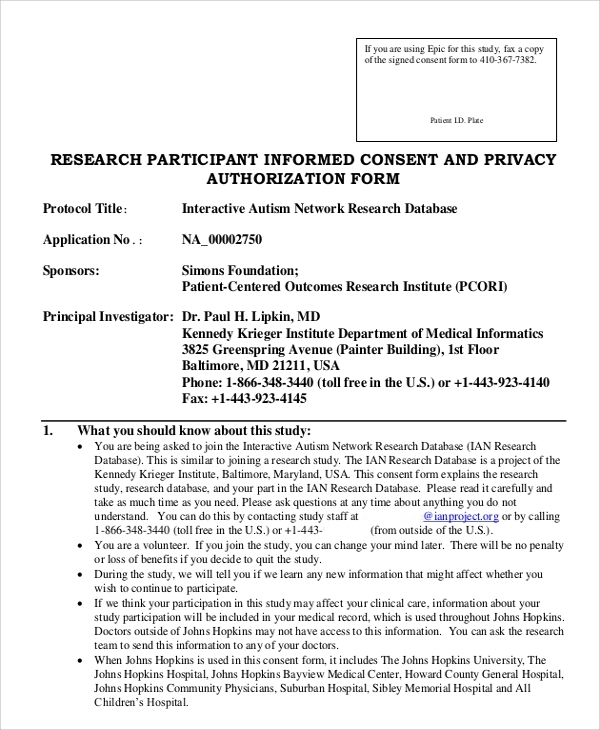 This research consent form is used where the participants or his/her guardian give the consent to participate in the research study after understanding the risks involved in such study. It is also an agreement to keep the private data secret, and other necessary provisions are also stated. The above-listed consent forms cater to different categories such as Emergency Medical Consent Forms, research project consent form, sports and athletic events and several such events. 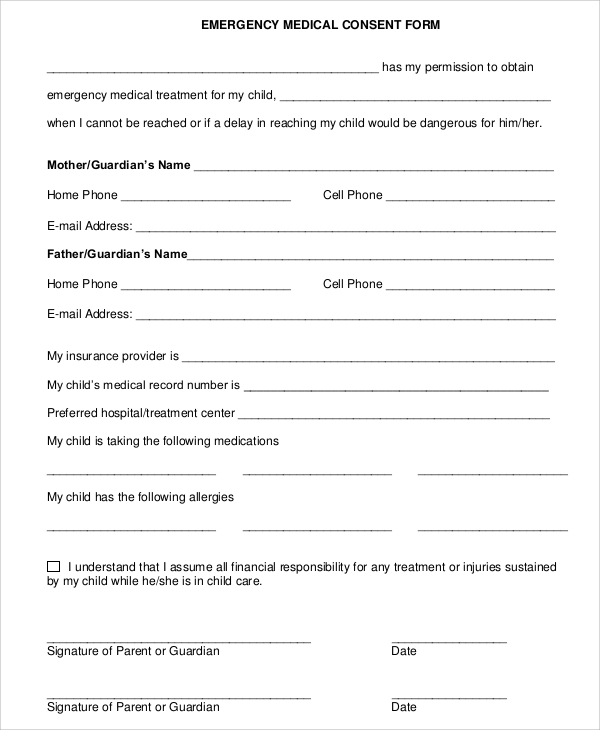 In medical consent form, not only the parents empower the guardian or the guided travel with the child to take an immediate decision, but they also contain medical condition information and insurance details that will come handy for doctors and hospitals. Such forms make participants and their associates aware of the risk involved in the endeavors. 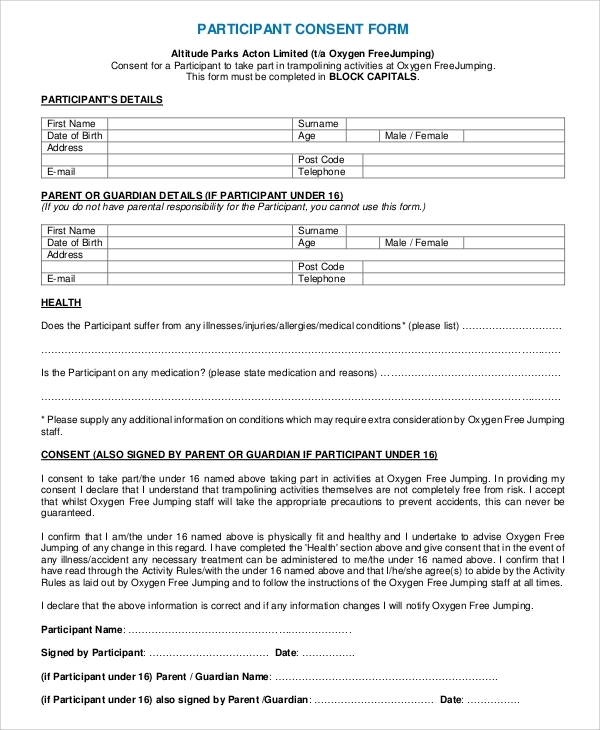 The targeted audiences for the consent form are the event organizers who are arranging sports event, research works or any general projects where there is a risk factor that needed to be made aware of. Parents need to have them in their possession to furnish them whenever their children are in travel mode. The schools and the guides need to take Emergency Consent Forms to be prepared to face any emergency situation. A consent form is a document that makes a person understand the risk involved in a project, be it a research project, standard project or even sports activities. It is signed by the parents if their children are minor. It also takes away a lot of responsibilities from the company’s shoulder or event organizer.